IBM Cloud Monitoring with Sysdig is a fully managed, enterprise-grade monitoring solution on IBM Cloudthat provides increased insight and faster incident resolution via a simplified data collection approach. The solution is optimized for modern container-based applications, and it collects and aggregates data across infrastructures and services. It offers administrators, DevOps teams, and developers full stack telemetry with advanced features to monitor and troubleshoot, define alerts, and design custom dashboards. Today, we’re excited to announce the availability of IBM Cloud Monitoring with Sysdig in the Frankfurt, Germany multi-zone region. Keep an eye out for additional expansion to additional MZRs in the upcoming months! IBM Cloud Monitoring with Sysdig is operated by Sysdig in partnership with IBM. Monitor the performance of IBM Cloud resources via the Explore Module. Sysdig is a single unified intelligence platform that offers the key operational capabilities for containers and microservices. Since 2013, they have worked with hundreds of enterprises on building the security and monitoring platform for their containerized environments, which means that they have learned a thing or two about what works and what doesn’t! Today, Sysdig offers an array of capabilities on top of the platform through their Sysdig Monitor and Sysdig Secure products. In 2018, IBM Cloud announced our partnership with Sysdig, and we have been able to successfully integrate Sysdig Monitor—a key component in the platform that provides microservice, application, and infrastructure monitoring—to the IBM Cloud. 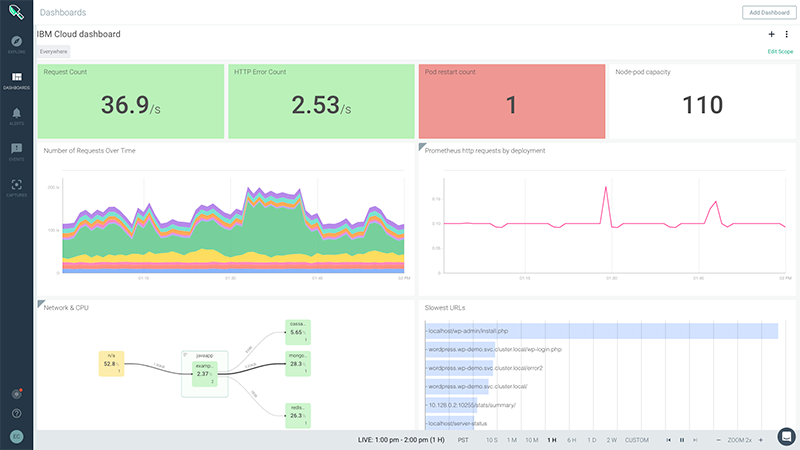 Sysdig Monitor combines deep container metrics, rich Kubernetes and Docker monitoring, and Prometheus monitoring for advanced application visibility, alerting, and troubleshooting. Through our partnership, we are delivering solutions to solve enterprise monitoring challenges and, ultimately, help organizations identify and fix issues faster. While containers and the associated orchestration (e.g., Kubernetes) have had a radical impact on how enterprises architect their applications through their simplicity, portability, and security features, it has come at a cost from an operations standpoint. Organizations need to understand the application inside the container as well as the actions the applications or even users inside the container are taking. Any given application may be made up of multiple microservices, which in turn can be made up of dozens or hundreds of containers. So, not surprisingly, this makes the simple act of monitoring response time, for instance, much more challenging than ever before. So how do we solve this problem? IBM Cloud provides developers and sysadmins the tools and guidance to help build complex apps in the cloud while Sysdig’s container intelligence platform offers tools for advanced data insights and security. The convergence of the two presents the opportunity to reduce environment configuration complexity while increasing insight speed. IBM Cloud Monitoring with Sysdig—which uses Sysdig’s Container Vision—is the unique answer that allows customers to see what’s going on in their black-box containers. Imagine a host running some containers and processes. Sysdig has a unique agent that is deployed as a container (or a process in a non-containerized environment) on the host. Unlike other solutions available in the industry, we run one agent per host, not an agent per pod or container. The agent deploys to the kernel module, which only does non-blocking reads of every system call with very low overhead. From these system calls, we extract all the data that you need, including host metrics, network metrics, custom app metrics, and security events. All this data is then sent to the agent, which is then sent to the Sysdig platform, where it is dynamically mapped to containers, microservices, and your orchestrators in a way that is both powerful and simple to use. In short, the Container Vision technology used by IBM Cloud Monitoring with Sysdig allows you to see everything from a single instrumentation point. The setup via our offering is also quite simple. Get started now by provisioning a free monitoring instance from the IBM Cloud Catalog and begin monitoring the performance and health of your cloud resources. After you’ve created your IBM Cloud account, our tutorials guide you through provisioning your first monitoring instance.